Bioreactor industry is one amongst the few vibrant business spaces where technology and innovations aptly outlines the key to opportunities and profitability. Major enterprises have been consistently investing in mergers and acquisitions to bring improvisations in the product portfolio and stimulate the business growth. The recent collaboration of Sartorius Stedim Biotech, a leading name in global bioreactor market, with U.S. based pharmaceutical maker, Nova Biomedical, bears a testimony to the aforesaid factor. Reportedly, the French biopharmaceutical giant is planning to incorporate Nova’s patent cell culture analyzer, BioProfile® FLEX2, with its ambr® multi-parallel bioreactor systems with an aim to formulate a dynamic platform that will be based on a fully automated at-line cell culture analytics. As claimed by a higher official, this integration would offer a complete solution to the QbD (Quality by design) based process development approach. Such exemplary initiatives by the leading players undeniably will upstream bioprocess development, which by extension will upscale bioreactor market demand. Single use bioprocessing technology (SUB) has gained a huge popularity in the bioreactor industry space in a relatively short span. Disposable bioreactors have emerged as a niche segment over the past few years and have created new end-use markets. Introduced in late 90’s, wave rocking platforms pioneered the bioreactor market and has brought the trend of disposable scalable cell culture bioreactors in R&D activities and GMP manufacturing applications. Industry analysts depict that the wave rocking SUB system was introduced to look for an alternative to the conventional stainless-steel bioreactors for commercial applications. Over the years, wave-induced motion market has carved a profitable path, that is quite evident from its past year industry coverage – if estimates are to be relied on, this particular business sphere have accounted for almost 50% of the overall bioreactor industry share in 2016. Subject to the benefits of improvised flexibility and adequate productivity, wave bioreactors is expected to grow at a massive rate in the ensuing years. Bioprocessing industry has witnessed stupendous growth in the past few years, given the extensive research activities that have taken place in the business space to develop novel biopharmaceutical products. In addition to this, a wide adoption of biotechnology in some of the evolving clinical spheres such as tissue engineering and antibody production have profoundly driven bioreactor market demand. In tissue engineering, bioreactors are deployed in the in-vitro tissue development process, wherein these advanced devices provide manual and biochemical regulatory signals to cells that promotes cell differentiation. Over the years, the number of single use systems (SUS) available in the bioreactor market for the development of biopharmaceuticals and production processes have witnessed an exponential curve. In fact, biopharmaceuticals manufacturers represented almost 30% of the overall industry share in 2016. These manufacturers increasing involvement in several outsourcing services such as cell line development, analytical, formulation, and other production related services is expected to upscale bioreactor industry demand. 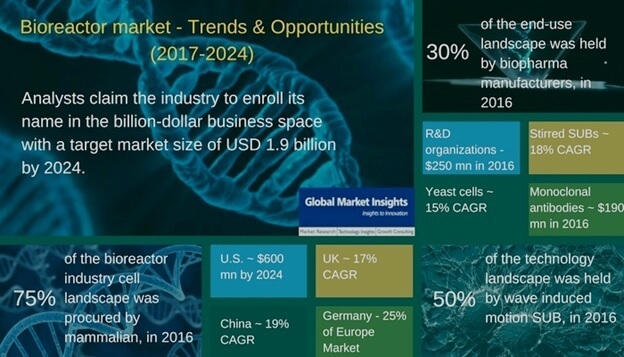 As per a recent report by Global Market Insights, Inc., Global biotechnology market is projected to record a massive valuation of USD 775 billion by the end of 2024, which undoubtedly sheds a positive light on bioreactor industry commercialization. Biopharmaceuticals are highly customized products which require completely specific manufacturing requirements. In addition to this, biopharmaceutical manufacturers are continuously dealing with pricing pressure of the biologics and reduction of development time, a factor that has upscaled bioreactor market demand across biopharmaceutical sector. The flexibility of single use bioreactors allow different modes of operation in a single facility and thereby support these tailor made processes. In fact, it is proven that single use bioreactors when handled correctly results in effective development of drug-device combination products. Undisputedly, technological interventions in drug manufacturing process is leaving an incredible impact in the overall bioreactor industry dynamics, with regards to quality, scalability, flexibility in operations. Analytical tools and innovative methods have not only brought an enhancement in process robustness, but have also enabled a much cheaper, safer, and low energy consumption production. The high-level safety, flexibility, and low capital investment make bioreactor market immensely popular across end-use sectors where several products are produced at the same plant with reduced costs. In order to meet the increasing demand from biopharmaceutical and bioprocessing industries, contract manufacturing organization (CMOs) are also outreaching with respect to capacity and capability. The steady rise in the number of new compounds is making their presence felt in clinical trials, which in a way is fueling bioreactor industry demand. Unsurprisingly, driven by the need to ensure a sound flexible production capacity and fast campaign change overs, CMOs tend to shift more toward disposable systems and components. Analysts believes, given the fact that CMOs work in a dynamic competitive environment, they are more eager to adopt innovative technologies in their operations that provide higher yield, lesser contamination, more productivity, and of course a feasible cost structure. All these conditions are very effectively fulfilled by disposable bioreactors, which finally results in an increased penetration of bioreactor market in the contract manufacturing organizations. The adoption of disposable bioreactors in clinical scale manufacturing is no more a supposition. With a strong pipeline of innovative products, bioreactor industry is now treading into mainstream commercial bio production. In this regard, it is prudent to note that the approach of biotherapeutic developers and CMOs with regards to single use bioreactor application differ in perspective. Unlike biopharmaceutical manufacturers, CMOs have less number of patent stainless steel systems. Subject to the fact that CMOs can directly handover the bio production cost to clients, they tend to implement single use technologies (SUT) and SUBs more spontaneously. Interestingly, it has been observed that CMOs deploy more complex single use devices than biopharmaceutical manufacturers. Bioreactor industry players have been striving high to develop innovative products to outsell their rivals. Mergers & acquisitions and global business expansion are two of the major strategic moves adopted by the participants to sustain in the competitive terrain. For instance, Sartorious Stedim Biotech acquisition of KSep Sytems, a renowned automated centrifugal system maker, under a transaction value of USD 28 million in 2016, marked the outset of another lucrative journey of the former player in the bioreactor market. Reportedly, these centrifugal systems are widely utilized in cell based therapeutics, vaccine manufacturing, and monoclonal antibodies. Speaking along the similar lines, monoclonal antibodies procured 35% of the overall market share in 2016. It therefore goes without saying that this acquisition has undoubtedly strengthened Sartorious business portfolio in the global space. Some of the other top-notch participants in the global bioreactor industry include Thermo Fisher Scientific, Merck Millipore, GE Healthcare, and Eppendorf Biotech. Biotechnology, despite having tremendous advancements over the years, is still considered one of the fairly novel fields to be experimented with. Nevertheless, the involvement of large sized enterprises across the bioreactor market is indeed commendable. The commercialization potential of the industry is quite evident from the estimates claimed by Global Market Insights, Inc., in their recent report, which asserts, bioreactor industry to cross USD 1.9 billion by the end of 2024, with a striking a double digit CAGR of 18% over 2017-2024.